When I woke up and opened the front door, I saw a squirrel sitting on my front lawn. It was just sitting there upright, holding something that looked like a nut between its front paws, maybe nibbling at it. 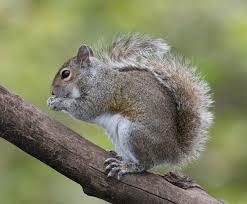 What does Squirrel symbolize? Squirrels are never still. They’re always hopping around, gathering food, storing food, planning how to get food. From this, the message is not so much food as such, but to find means to support myself, and that means work. Next, what was it doing? Sitting quietly, maybe nibbling on nuts. Maybe the need to learn more by sitting still, learning? What color was it? Grey. Learn to distinguish black from white and all the shades between. Life’s not always black and white. How many squirrels? One. This is the number of creation, going for it, striving. To put this together, a day to gather knowledge, learn, study, on my own, taking initiative. ← Today’s Aspect: Sun trine Moon from Pisces to Scorpio.